After a long flight from England I was pleased to find my Johannesburg hotel was very comfortable and provided a very hearty breakfast in the morning. In the morning our transfer vehicle arrived and I met up with my fellow guests, Bonnie (MD) from Washington and Florian our mystery German in the back. Florian is no ordinary guest – he is a professional photographer doing an article on Limpopo Valley Horse Safaris (to be known as LVHS from now) and we spent the five hour journey to the border in fascinating conversation. We reached the border around 1pm where we had to have our passports checked. We were met by Cor Carelsen who with his wife Louise are the managing directors and owners, and his Swiss Shepherd dog Suco. The transfer to Botswana is so unique and not for those with fear of heights. It consists of a cage on wires over the river Limpopo. We then had a break to relax, read, or sleep and then drove to base for our afternoon ride. When we ride a second time different horse are assigned so we have to go back to base. I rode Albany a 16hh Boerped who was really nice. We got back to our camp in the dark. After our meal we sat round the fire again. I was glad I had brought my hot water bottle although they were provided for those who hadn’t brought one. It was another very noisy night. We had delicious muffins for breakfast and were out riding out by 7.10. Saw lots elephants and zebra quite close, Black backed jackal, Eland, Kudu, African wild cat. Then we espied three lions just long enough for quick photos then we removed ourselves from the lunch menu. Soon we were enjoying long canters. After lunch I read till the sundowner bush drive. Kathy McKinnon and her partner, Richard, arrived from Sydney. We saw elephants on the way out and a tree full of baboons with young ones. We drove to watch the sunset. We had a South African delicacy: oxtail – our American lady had never heard of oxtail and thought we were teasing her. I managed to sleep well till 4am – more monkeys using my tent top as a toilet but the rest of the noises not too bad. So I got up early and sat on porch till tea time. 7.10 left. Had a lovely long early canter. Florian went in the vehicle to take photos and was waiting for us to do a spectacular canter. As Rhodes got a bit excited I lost my stirrup but was told not to hold onto the saddle and spoil the photo. I decided discretion was the better part of valour and held on anyway! We stopped under a shady Mashatu tree. We had good long canters today. Saw zebra and wildebeest. Normally the riders do not attempt to chase, herd or harass the game but in this case we were allowed some leeway for the photography and we used our horses to manoeuvre a group of zebra and eland for the camera. At the third attempt they were too wise and it didn’t work. At lunch we talked about marriage. I read my book till 4pm. When we had the privilege of a bush drive with André the lion and cheetah specialist and Edward our driver. Saw lots of elephants, lions and several cubs quite close. As André has collared one of the male lions we were able to track him down on the dried up river bank but had to be quiet and respectful as he is quite grumpy. We also saw an elephant with a very young calf behind. We also tried to find the collared cheetah but with no luck. Instead went to see an impala which the leopard had stashed up a tree. André’s plan was to get the carcase down and put it in a humane trap and then collar the leopard, which he later did. Then we returned to the lions that came alarmingly close. On the return drive we saw civet, porcupine, elephant very close, genet and jackals. Just near home using the headlight we spotted a hyena threatening a very small elephant calf and saw the mother chasing it away, trunk raised in anger. Back for a great dinner of beef. Sat by fire and talked till 10.15. The photographic challenge for today was to try to get Saskia near zebra for photos. Florian also lay on the grass and we cantered past him several times! We had snacks under a tree. On our evening drive we saw 2 jackals and looked for cheetah but no luck. Had great dinner of goat - Richard talked about bizarre meals he had eaten. Got up 5am as something small had been scraping/gnawing under tent nearly all night and the monkey toilet kept me awake too! 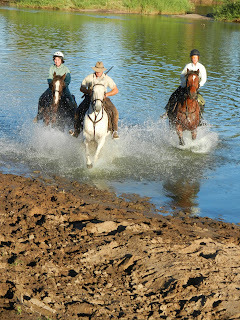 We rode out to the river and had lovely long canter along the Limpopo. We were very lucky to see a hippo and crocodile together. Also we had a great long canter before lunch. We saw plenty of baboons but not much game. We had a good long canter towards home and I helped wash down the horses on our return. We spotted Waterbuck. As I was following Cor quite closely I just HAD to jump a log! – Conversation round the fire this evening was Crime and Punishment! Saw elephants today and then we had to retreat as they were getting anxious. Hardly saw any game and so walked quietly and had a nice relaxed ride. Time for jumping -yee haaa!–we followed David . We did several then I got left behind and missed jumping a bigger one (honestly I didn’t chicken out – I couldn’t see the leader any more!!) In the afternoon was a game drive with André – we were after the collared leopard but had to give up. We saw giraffe and had a great spot for sundowners. Had a great curry for dinner and we all retired quite early. Got up 5.30. Rode along ridge (dam) and I took photos of shadows. Kathy and Richard decided not to ride so David had to lead Cimarron back to base. It was hilarious to watch especially when cantering. David had to keep avoiding acacia bushes and sometimes Cimarron went the same side and sometimes he didn’t! What a great display of horsemanship!! Then David and I did jumps – just logs but it felt like a great cross country course. 1½ hour ride to stables. Horses whisked away – no time to say goodbye and get sad. We then had brunch of sausages, bacon and tortilla. Then we had to say our sad goodbyes to all the people who had looked after us so well. Cor drove us to the border with the dogs galloping alongside us. The cage swung us over the Limpopo and we went back to reality.